Dive into crystal clear waters with underwater visibility of up to 40 meters. Discover shipwrecks, cliffs covered with sponges, colorful corals, gorgonians, turtles, sharks, rays, and even the very rarely seen exotic fishes like Spanish dancer, harlequin ghost-pipefish, camouflaged frogfish and fire gobies. 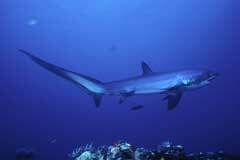 Thanks to the convergence of the nutrient rich waters of the Pacific Ocean, South China Sea and Celebes Sea, you will be a spectator to an aquatic symphony of over 2,000 species of marine fish as well as more than 800 out of the 1000 known coral species in the world. 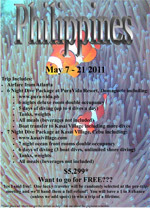 7 Night Dive Package at Kasai Village, Cebuincluding:. Want to go for FREE??? Yes I said free! One lucky traveler will be randomly selected at the pre-trip meeting and we’ll hand them a full refund! You will have a 1 in 8 chance (unless we add spots) to win a trip of a lifetime.